In 1995, EBMA's predecessor - the European Bluegrass Network - came into being with Dennis Schut, Patrick Brunet, Andy Glandt, Rienk Janssen and Paolo Dettwiler forming the original Board of Directors with their mission statement being to: 1. Unite Bluegrass forces in Europe; 2. Promote the quality of European Bluegrass; 3. Further Bluegrass Music in Europe. Over the next few years the first European Bluegrass Directory being drawn up and the first European World of Bluegrass (EWOB) event being held in Lichtenvoorde in the Netherlands. EWOB has subsequently become an independantly run and eagerly-anticipated Bluegrass event. In 2001 the European Bluegrass Music Association was born with Paolo Dettwiler taking the Chair and Andy Glandt, Richard Hawkins, Rienk Janssen and Angelika Torrie forming the original EBMA Board; and from that inital board, Rienk and Angelika have served on the Board throughout these past 14 years. EBMA works towards an integrated European bluegrass scene that enjoys strong, mutually supporting relations with international and national organisations. 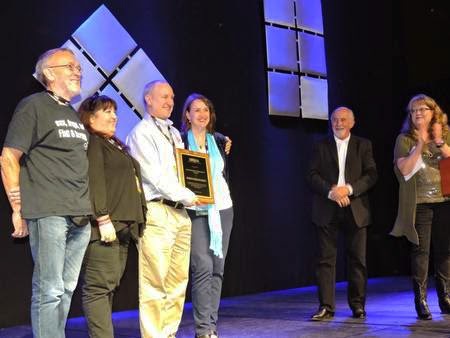 In 2014, the EBMA was awarded the Distinguished Achievement Award at the IBMA World of Bluegrass event in Raleigh, North Carolina. From the IBMA's press announcement "Since its inception in 1995, the European Bluegrass Music Association has worked to support bluegrass music across borders, both regional and national. The non-profit organization produces a magazine (Bluegrass Europe) for its members, promotes bluegrass festivals held throughout Europe, and holds regular gatherings, known as Bluegrass Summits, aimed at supporting and encouraging the burgeoning bluegrass scene across Europe." The EBMA will be holding the 14th General Membership Assembly on Saturday 14th March during the 2015 European Bluegrass Gathering in Munich. All members of the EBMA have the right to attend the assembly, vote on matters concerning the work of the EBMA as well as nominate and vote for members going forward for election to the Board. Subscribers to BLUEGRASS EUROPE, and members of any national bluegrass music association, are welcome to attend the Assembly as guests. 2014 was a wonderful year for the European Bluegrass Music Association thanks to the recognition from the IBMA which was achieved through the hard work of the Board (past and present) over the past 14 years since the EBMA was formed and through the support of the EBMA membership. HAPPY BIRTHDAY EBMA...... is there any cake? If you are interested in becoming a member of the European Bluegrass Music Association then please visit the Membership page.